The trouble with memories is that the strongest ones and the ones you retain are more often tinged with sadness; one such memory is the death of two 893 personnel. During the refitting of an ejection seat in the hangar a service procedure possibly was not followed with the result that the seat activated taking with it the supervising CPO and the LAM(O); both died within a very short time of the accident. Now, bearing in mind that this was within a few weeks of me joining the ship, as the newest mess member I had the bunk that acted as a seat and was in use much of the time. This meant I could not turn in until everybody had decided to vacate the seat. The Leading Hand of the mess had told me that I could have the next folding bunk to become available. Guess which mess the fatally wounded LAM(O) was from and I was ordered by the Leading Hand of the Mess to move my bedding into what was now a spare bunk. The phrase "Dead man's shoes" almost became too literal. 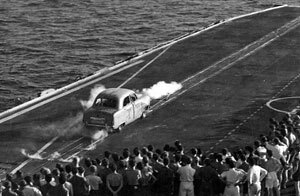 I remember a car being fired from the port catapult, and if my memory serves me a dummy was put in the driving seat in a naval officer's uniform. I often wonder what some future unsuspecting diving expedition is going to make of one Ford Prefect miles from land sitting on the ocean floor. 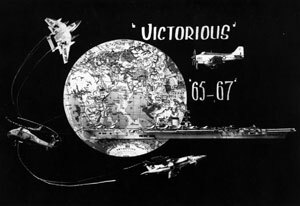 Anyway Sea Vixens and the Victorious. In 1966 we sailed with Mk.II Vixens as you know the visual difference being the protruding liquid oxygen tank stowages on either wing. I also remember a rather nasty radio aerial on the underside which was aptly named a 'Sharks Fin Aerial'. During the course of routine servicing as a young greenie (Electrician) I often cursed that aerial as it always caught me as I ran under the aircraft. The scars have healed now but despite the warnings about it we never learned. Our mess was under the angle either 6a or 6b I can�t remember which for sure. This mess was highly sought after because it had a large recreational space. To our horror, during a refit six new bunks had been added and the 'rec space' was no more. After a count up by the killick of the mess he noticed we had six spare bunks with everybody on board so out came the cutting tools and they were consigned to the deep. 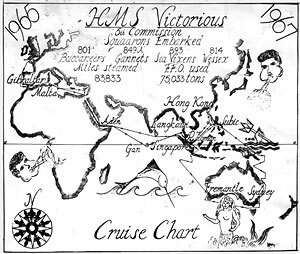 All went well until we arrived at Gibraltar. There, six new members were sent to our mess. The reg office was informed that we had no room or bunks, which resulted in a visit from the friendly regulating staff. They took one look and then went off moaning about idle dockyard mateys who had been detailed to install new bunks. Oh happy days! When I was the deck greenie I used to position myself in front of the island during launches (standing there, was as close as you could get to aircraft at launch, any closer and you were toast). I used to like to stand there at launches, as the Pilot went to full throttle, signalled his readiness to the FDO, (Flight Deck Officer) my teeth would vibrate; the noise was horrendous. Even with the JBDs (Jet Blast Deflectors) one could still feel the hot blast coming from the twin tail pipes. Then, as they reached full power down would come the FDO's flag - whoosh went the steam cat and off into the wild blue yonder it went closely followed by the aircraft on the other cat then the noise was gone. The power of the Rolls Royce engines was so evident. At times we would launch four aircraft and then clear the deck to recover four. We attempted to fly four over four ie four off then four on, turn them around and repeat the procedure. Of course while we were doing our bit 801 (Buccaneers), 849 (Gannets) and 814 (SAR Helicopters) were all completing their respective flying programs. The flight deck was a dangerous place to be during flying operations and considering that the average age on deck was at times less than twenty, accidents were kept at a minimum throughout operations because we were disciplined and trained. I remember my first visit to the hangar shortly after joining the Vic in 65 I was on my own and found my way down to four deck, (remember I had not even seen an aircraft carrier before let alone served on one). I knew it was on four-deck somewhere so I asked a CPO (who looked very stokerish) if he could tell me where the hangar is. I was at the time actually standing outside the hangar access hatch to which he politely told me so and then went off muttering f****** WAFUS.